Wow! So much awesomeness packed into one day it makes my head spin! 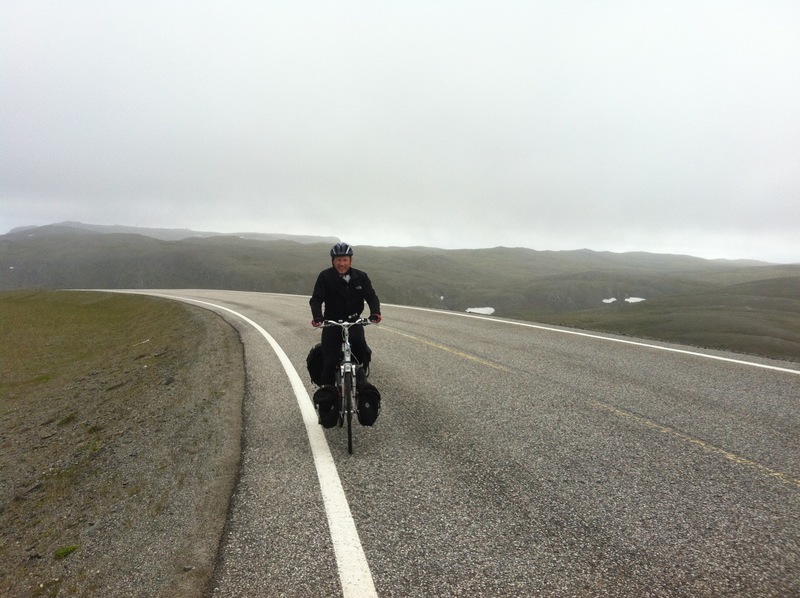 The strongest headwinds to date as I crawl up the windswept, barren coast from Repvåg to Honningsvåg to meet up with Chris for lunch. Beautiful and worthy of a final approach to the end of the earth. Then, entrance to the final approach is only granted to those that can pass ‘the tunnel’. A 3 km dive to 212 m under the sea at 9% slope, followed by a 9% climb to materialize in the rocky, mountainous spectacular Magerøya island. I stop at the entrance to gather myself and eat a chocolate bar or 5. The wind is howling at the entrance and a periodic electronic chime sounds from the mouth of the tunnel as if to warn those that dare to enter. A car emerges from the tunnel and a Swedish couple get out. ‘it’s long and steep,’ they warn, ‘and no room to walk your bike!’ They look concerned for me. I know what I am doing, I reassure them, and plunge in. I pass the roll down gate 20 m inside the tunnel that opens and closes in the winter to let the individual cars pass, and then accelerate to the depths. Faster and faster, and I get colder and colder. I start to shake from the cold and my teeth start to chatter as I accelerate down and down into the dead straight tube. When cars pass its like an enormous train passing by just over my head. Then, it’s silence once more. Just the whirring round of my wheels. I am glad when I reach the bottom and start cycling out. I can warm up. It gets steeper and steeper as I slog forward in low gear. But, there is no headwind: a blessing. 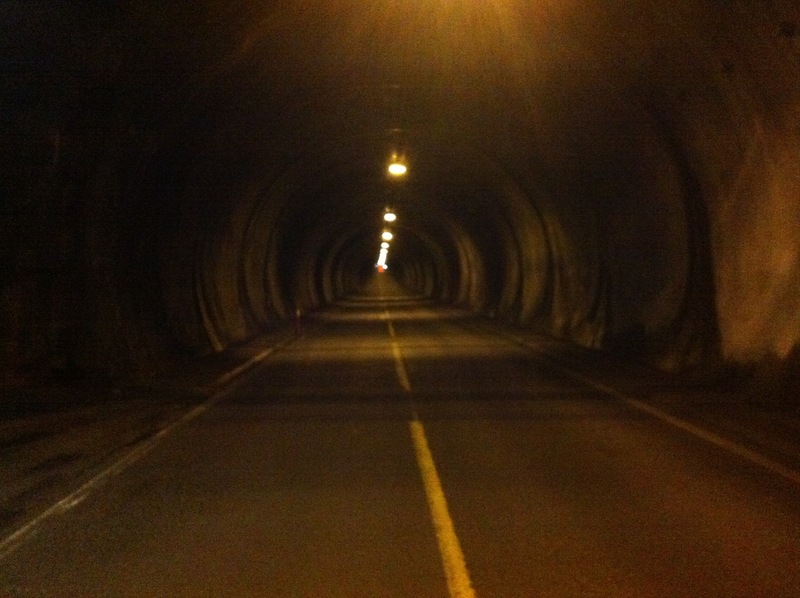 Following the coast, now on Magerøya, I crawl along further into the wind before entering another long tunnel. This time it was must less strenuous. A gentle climb for 2 km and a gentle drop, again without wind. I start whistling, making an orchestra of sound echoing off the walls from all directions. A tribute to mum. All her favourites. She whistled all the time. 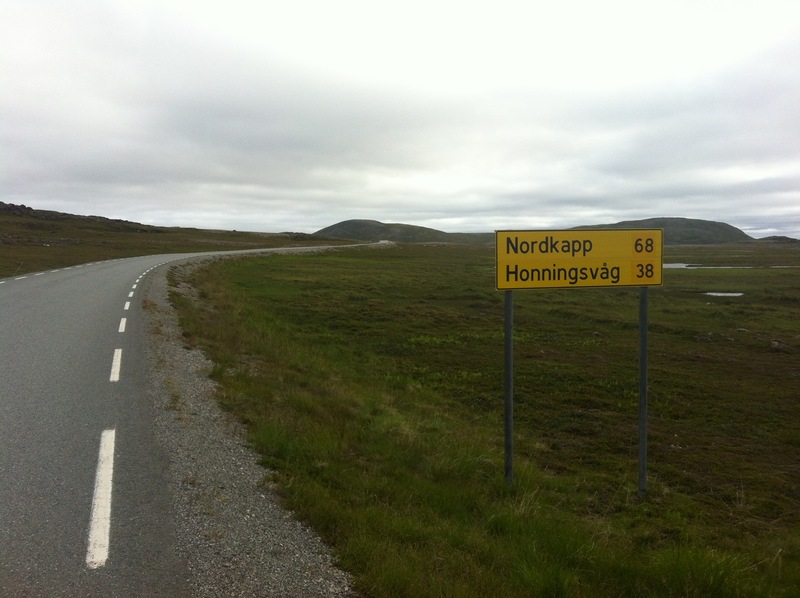 I arrive at Honningsvåg and enter the Nordkapp guesthouse (quite a common name in these parts). Chris is upstairs in the communal area reading a book in the warmth. We sit and a chat, comparing stories of this trip and others, and made plans for the day. 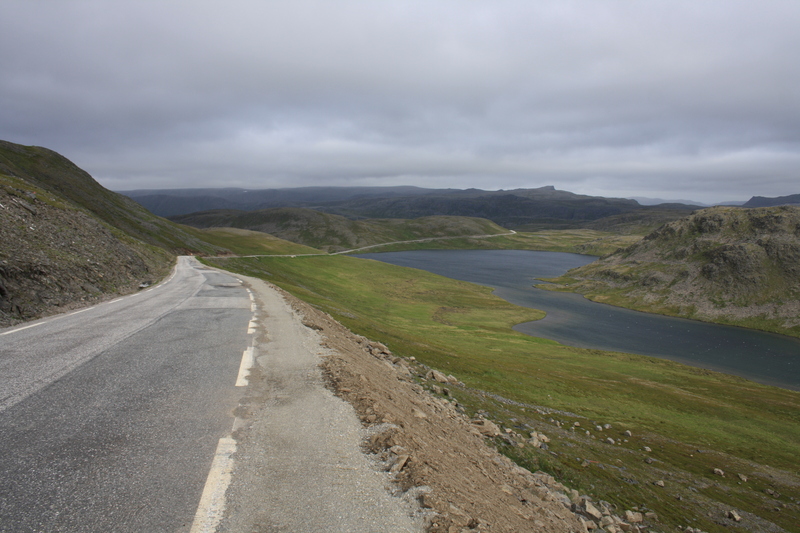 Cycle the last 30km to Nordkapp and then a walk to Knivskjelodden for dinner. 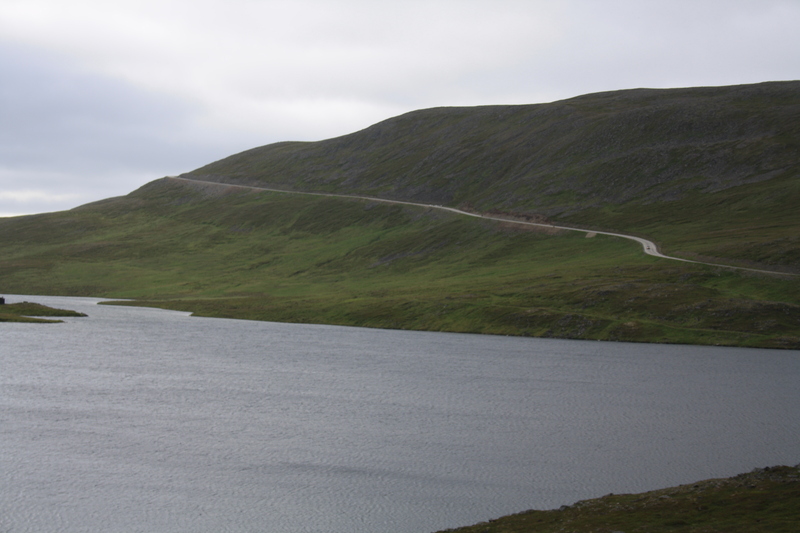 This is the true most northerly point of Europe: a low lying peninsula one bay across from the Nordkapp. A 9 km walk from the carpark. We go shopping, planning to cook up a feast on the most northerly point, watching the bus loads of tourists on the Nordkapp. We talk and talk, and laugh, and before we know it, it is 15:00. We need to hurry. We still want to do a lot. The final assault can only be completed by those that have made it this far. The wind is brutal, as are the long steep climbs: up and down and up again. 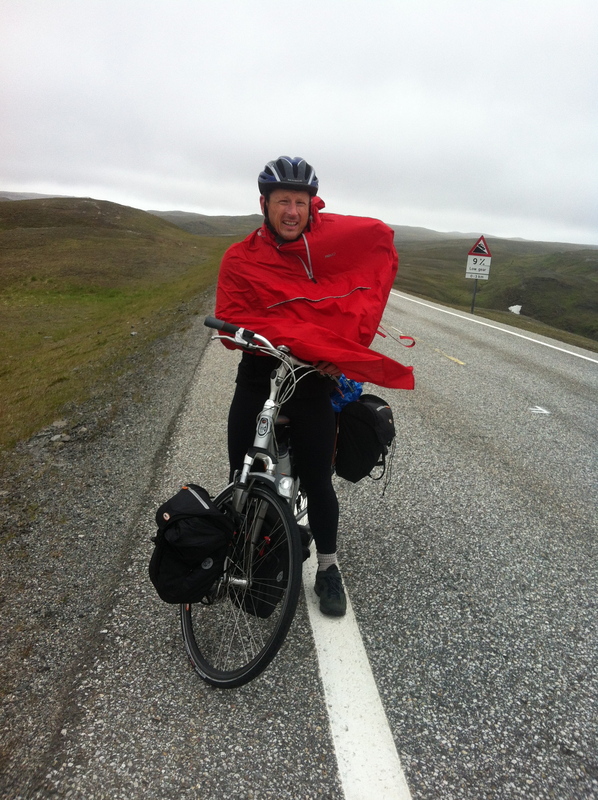 During the whole trip from the Lofoten islands to here, I have had a head wind. The gods smile on us today and dish up a hurricane that is conveniently a tail wind on all up hill stretches and a ferocious head wind going down. On the flat bits it is often a side wind. And, man, it is beautiful scenery. A winding road through rugged, barren, rocky land. Grass and moss. Rocks and stones. Lakes and fjords. Herds of reindeer. Sweeping views before dropping down along the road curving down to the bottom. The last grunt to the Nordkapp is with a side wind and we freeze to death. We stop at the start of the walk to Knivskjelodden and hide under the shelter out of the wind for a snack. Then up and up. We get a discount entrance to the North Cape complex. Cyclists are classified as British students and get the reduced rate. We pass through the village of camper vans and buses and into the warmth. From inside we look out the glass at the globe which everyone photos when they come here. That is for later. First a hot chocolate, a waffle, and soak up the warmth. Well, dear readers. Here is the proof picture. 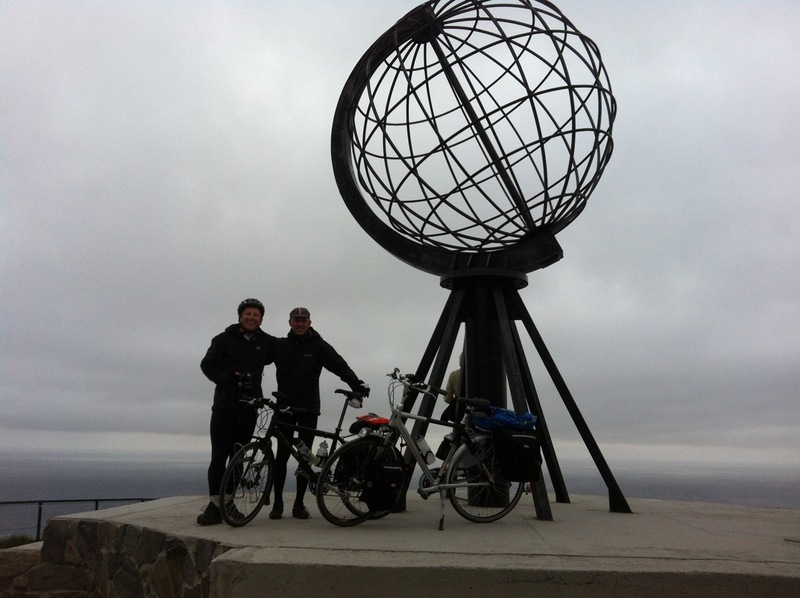 Chris and I at the North Cape. It is too cold and too late to go to Knivskjelodden, and so we have dinner at the restaurant at the end of the universe and make our way back. We remark over and over with glee how perfect the direction of this hurricane wind is. Perfect head wind to brake our steep descents and perfect tail wind on the climbs. We whiz on home in 2 hours. 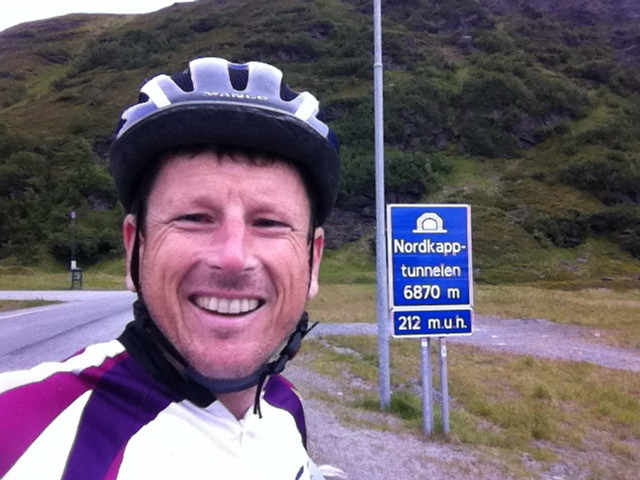 A snappy time for 30 km in Norway. Content, I curl up into bed.